New York’s Wadsworth Center Laboratory was one of five state public health laboratories selected by the Association of Public Health Laboratories as a pilot site for Mycobacterium tuberculosis complex (MTBC) Whole Genome Sequencing (WGS). The Wadsworth Center Bacteriology and Mycobacteriology Laboratories will sequence all strains from patients in New York State, including New York City, with this highly comprehensive testing approach that assesses all 4.4 million bases of the MTBC genome. More than one species of mycobacteria can cause TB disease. The closely related bacteria that cause TB are referred to as Mycobacterium tuberculosis complex, or MTBC. Previously, characterizing these highly related organisms was challenging; however, WGS overcomes the limitations of older methods and provides more information than before. 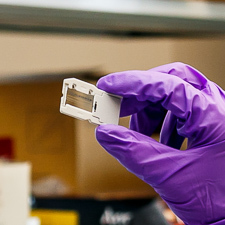 WGS replaces eight tests including real-time PCR, DNA sequencing, and spoligotyping assays. WGS can identify mixed cultures of non-tuberculous and tuberculous mycobacteria, which would be missed by other methods. Previous molecular tests only targeted small portions of the genome. Rather than this snapshot approach, WGS looks at the whole picture. For example, while former molecular tests failed to detect any drug resistance-associated mutations located outside of their target region, resulting in some resistant strains going undetected for weeks, WGS identifies all mutations linked to drug resistance by interrogating the entire genome. In addition to sequencing, a method called spoligotyping has been used for years to determine strain relatedness of MTBC. This method identifies the presence or absence of 43 regions of DNA across the genome and assigns a strain type based on the pattern of these regions. While spoligotyping is fast and inexpensive, it has the major disadvantage that these patterns cannot discriminate between closely related TB strains. WGS overcomes the limitations of spoligotyping and can distinguish the most closely related strains with the highest level of resolution. As treatments for tuberculosis can take months to years, the earlier the patient is placed on the right treatment, the better. WGS can determine which drugs the TB organism is resistant to faster than other methods by weeks and even months. It can identify resistance to second-line drugs, which would never have been found when first-line drugs are susceptible. Sometimes contamination with other bacteria makes traditional drug susceptibility testing impossible and in many of these cases, WGS is still able to quickly and accurately indicate which antibiotics could be used. WGS also has the benefit of detecting heteroresistance, or different patterns of resistance, within one specimen that may be advantageous to understand and factor into patient management. This crucial information, rapidly provided by WGS, results in faster implementation of effective treatment of drug resistant TB cases, reducing the cost of treatment, limiting the spread of drug resistant strains, and increasing the likelihood of positive treatment outcomes. Recently, the laboratory was awarded an NIH R03 grant to explore methods to perform WGS directly on sputum specimens.